Tanks belonging to Bashar Assad's forces entered demilitarized area. Israel complains to UN. Three Syrian tanks entered the demilitarized area between Syrian and Israeli territory on the Golan Heights border Saturday. 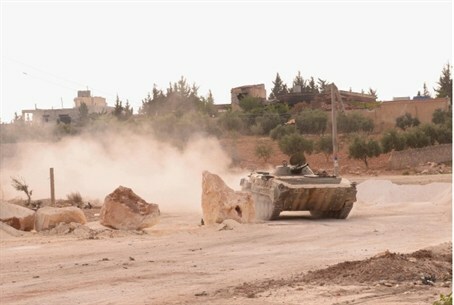 The tanks, which belong to Syrian strongman Bashar Assad's forces, entered the village of Bir Ajam, a short distance away from an IDF position. Israel lodged a formal complaint with the United Nations. Sources in the defense establishment said that while the tanks' movement was not intended against Israel, it still constitutes a breach of the 1974 armistice agreement between Jerusalem and Damascus. Several mortar shells also fell in the demilitarized zone between Syria and Israel Saturday, and one may have caused a fire at Mount Hozek, near the border. The IDF said none of the shells fell within Israel. The shelling is also part of the Syrian infighting.